A few days ago, I updated my LiveID credentials and noticed no matter what I entered into Windows Live Mesh, I couldn’t log in on my Windows 7 systems. Through some trial and error, I discovered the reason: I had enabled remote streaming in Windows Media Player which uses a new feature called “Link Online IDs” to connect me to my home PC for streaming. 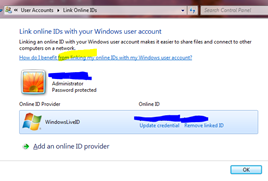 It’s a simple feature- a small plug-in adds my Windows Live ID to my credentials on the PC. It appears Mesh also uses this feature so when I updated my online password, my credentials broke. There’s no notification, just the 401 access denied error. What makes this even more unusual is that I can log into websites and Zune which also use Live ID without issue. It appears Mesh looks to your PC credentials as the “Master list” while the web browser and Zune are app-specific. But it’s an easy fix. Just go Start and type “Link Online IDs” into the Search box. Then launch the top option and click “Update credential” for Windows Live. Now go back and re-attempt login into Mesh – problem solved. Thanks for this I was also having trouble with it.